I love being introduced to new Australian breweries and recently Victorian breweries Red Duck and Southern Bay have found their way into my beer filled heart. Red Duck was recommended to me by Mitch, chef at Five Bar and beer/food dude behind Beersine who I may have mentioned once or twice in the past. I think his wording was something along the lines of “you have to get them, they’re f**king fantastic”. Hard to go past that sort of review. [p.s. mum, sorry for the swearing]. I picked up The Bear and Smells like a Pony and damn was Mitch right! My partner and I had these a while back to put some fun into cleaning the house. 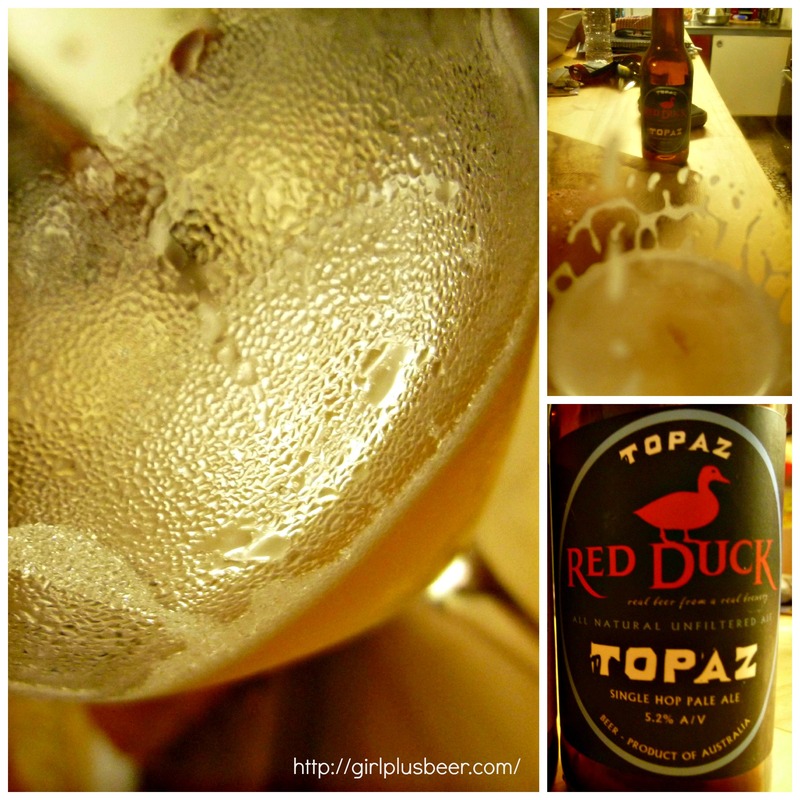 My latest Red Duck experience came in the form of their Topaz, a single hop pale ale and another limited release. I loved the big floral aromas with hints of apricots and flavours of lemon, tropical fruits and some grassy characteristics too. I instantly thought it would be a grand love affair with a strong vintage cheddar. Sadly, and rather unusual, there was no cheese in the fridge for me to test my theory. Topaz is an Australian hop variety that the guys at Red Duck had previously played with for their Hop Bach beer, using it alongside 24 other hop varieties. In doing so they saw a lot of potential in Topaz, you can read more about it here. Southern Bay Brewing was recommended to me by Joel at Cellarbrations Carlisle, in particular the Southern Ocean Ale which I took to a great Chinese dinner at The Red Teapot. This time I had the Southern Bay Requiem, beautifully labelled with a hint of Shakespearean ink and classical music, which boldly makes the statement “lager is not dead”. Light straw in colour with kiwi fruit, citrus, delicate malt, herbs and a soft bitterness to finish, it’s brilliant. Not only does remind you that lager isn’t dead but lager can be subtly amazing. 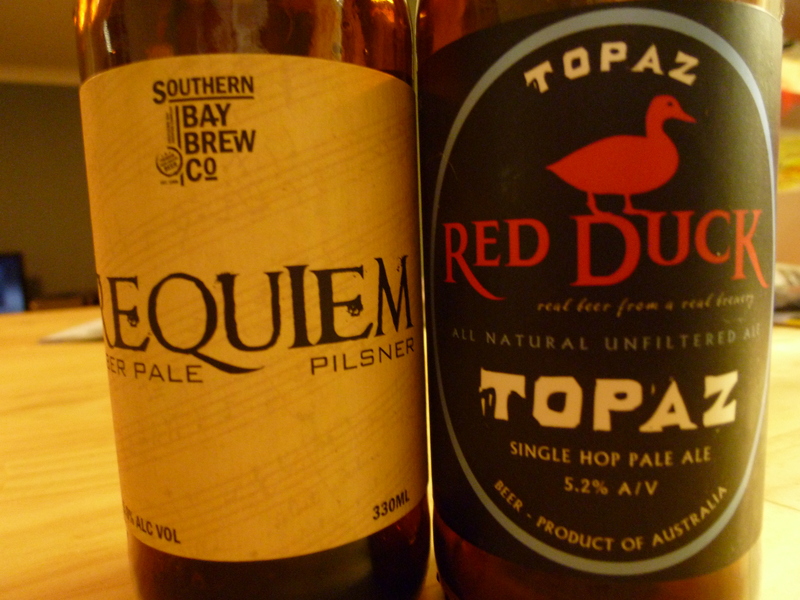 If you’re heading to Good Beer Week in Melbourne next month there’ll be plenty of chances to indulge in both Red Duck and Southern Bay Brewing. Check out the program of events at the Good Beer Week website.